The scene was Raceway Park right here in Shakopee. It is a 1/4 mile asphalt oval with not a lot of banking. A little different type of track than what you normally see flat track bikes raced on. Apparently Billy picked up the tank from the painter Friday morning, and in the last minute flurry, the fuel line was overlooked. When the petcock was opened to start the bike for the first time (which occurred at the track) fuel ran directly onto the ground. Oops. After borrowing a piece of gas line and installing it, the bike started (it is push start only, with no kick starter) and ran pretty good in the pits. But it soon started to puke gas out the overflow hose. My educated guess is that some debris from the inside of the tank caused the float needle to hang up. Its been my experience that any tank that has recently been a body shop probably has unwanted foreign matter in it just dying to cause problems. I like to use a large capacity fuel filter in situations like this, even on race bikes. Billy wisely ended up having someone else run the XL, despite the overflowing carb (wisely in not riding it himself, not in running it with the carb overflowing), just to get a few "break in" laps on it. Of course with it flooding out as it was, the results were less than spectacular. In fact, with my shop's name on the tank, it bordered on the embarrassing. Of course my wife Jane and I, our grandson Max, and our son Joe and his girlfriend Kristen were all sitting in the stands and thus knew nothing of why the bike ran so poorly. All we knew was that there was a problem. About that time I was pretty happy that I had not pulled the magneto when I installed the top end, because I would have been wondering if I had gotten it in a tooth off. A bright spot was Billy's performance on his other bike, a Rotax powered machine. Billy came out and put on quite a show! 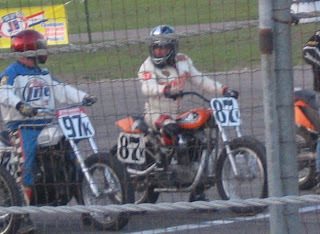 In both his heat race, and the feature, Billy was in the lead before the end of the first lap and increased his lead on the nearest competitors with every corner. To say that he dominated would be an understatement. Billy's performance was all the more impressive when you realize that he is in his late 50's. The next outing for the bike will be toward the end of next month at the same track. Hopefully by then a few of the bugs will be worked out on the XL and maybe with a little luck it will have been dyno tuned. That's the good thing about racing. Even after a disappointing performance you always have the next race to look forward to. I have decided to create a new category named "Lessons from the Pulpit." Under this category I plan to post short thoughts on sermons that I have recently heard. Since God has blessed my wife and I in placing us in a church where the preaching seems to always "grab" our hearts, I do not think it will be difficult. The only potential problem I can foresee is that, if I do not comment on it soon enough, some of the particulars will begin to fade from my memory. That is a sad indictment of my flesh, and not of the preaching. This last Sunday morning's sermon was on Proverbs 4. Wisdom. Surely wisdom is something we all desire to gain a little more of. Verse 7 says "Wisdom is the principal thing; therefore get wisdom: and with all thy getting get understanding." In my bible, next to this verse I have a note referring to Proverbs 9: 10 "The fear of the LORD is the beginning of wisdom: and the knowledge of the holy is understanding. By the time our Pastor was half way through the sermon I was ready to go back to school, or maybe commit to trying to learn Greek! Not that I think I can actually find time to do either of those things, but it is a testament to how inspiring I found the sermon. One of the final points concerned verse 13 which says "Take fast hold of instruction; let her not go: keep her; for she is thy life." Take hold of what you learn; make it a part of you; put it into practice! I am not sure that any "learning" can even be called wisdom, unless you grasp it in such a way that it is there for you to use when you need it . May God help us all to bring to mind his word each time that we need his guidance. Hmm, guess that would be pretty much all the time! Kind of reminds you of the movie title "World's Fastest Indian" doesn't it? Sorry, nothing quite that cool here. Cool ....but not that cool. I recently finished work on a set of heads for an Indian PowerPlus 100 (that's the late model overhead valve engine, not the Flatheads of yesteryear). These were not the first of these heads I have done porting work on, but they were the ones I put the most time and effort into. On the previous heads, I was strictly doing an "basic" porting job. I re-used the stock valves and simply worked with what was there. While I was still able to get a sizable increase in flow, for the valve size the results were disappointing (at least to to me). Thanks to Jeff Moll, one of the techs over at Fury Motors, on this set I was able to go a little further. Jeff not only sold the job to the customer, but he also provided me with a spare head for me to do preliminary experimentation on. The PP100 (PowerPlus 100) heads were supposedly designed by a BIG name automotive firm who shall remain nameless to protect the guilty. Well, maybe not guilty; for all I know they may have been directed to design a lousy flowing intake port. If so, they succeeded with flying colors. 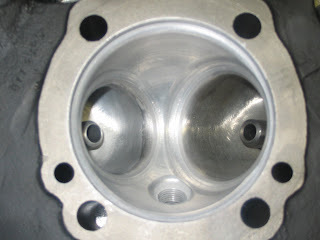 If you are familiar with the ports on Harley heads, then just picture the worst Shovelhead intake port you have ever seen and an average Evolution exhaust port blended into one head with a Twin Cam combustion chamber. Oh well, I guess it could have been worse. They might have used a Twin Cam intake port with a Shovelhead combustion chamber. Of course then they would have the Screamin' Eagle 103 open chamber head. Hmm. Be that as it may, suffice to say, the PP100 has a decent exhaust port, a decent combustion chamber, and a really bad intake port. Now a bad intake port is one that flows poorly. 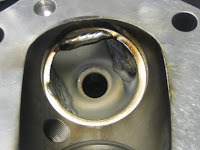 A really bad intake port is one that not only flows poorly, but is missing material where it is needed to get good flow. 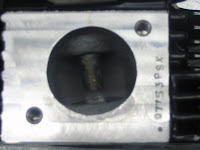 Where Evolution and Twin Cam intake ports have a generous "hump" in the floor, the PP100 intake ports actually have a slight "dip" in the floor. Add to that the fact that each side wall of the intake port has a large "divot" across from the valve guide, and you have a head that is just plain begging "weld me ...WELD ME!" 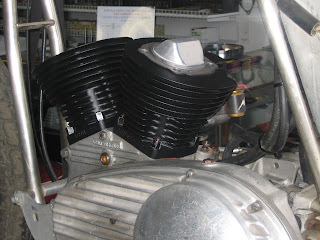 A stock Indian PP100 intake port flows about 199 cfm at .500" valve lift, and about 206 at .600. Simply doing a standard porting job on this head using the stock valves will bump the flow to about 220 cfm at .500" and 234 at .600 (all of these flow figures are given at 25" test pressure). 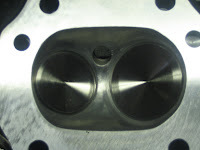 As a reference, stock Twin Cam heads flow about the same as the stock PP100 heads with a .100" smaller valve. Now if you increase the size of the Twin Cam valve to 1.900" (still .040" smaller than the stock PP100) and do a decent porting job, your flow will be about 243 cfm at .500 and 253 at .600". So, you can see why I felt the flow on a ported PP100 was disappointing, because despite gaining nearly 30 cfm, for the valve size it was dismal compared to a Twin Cam. In fact it is a little dismal compared to the 232 cfm at .500" lift that I can normally get from a Shovelhead (which incidentally uses the same valve diameter as the PP100). As is most often the case with production heads, the PP100 heads suffer from the diameter immediately under the valve head being too large for the valve size. 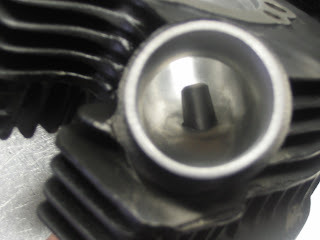 The easiest method to rectify this is to install a larger valve, which was the first step in working up the "spare" head. 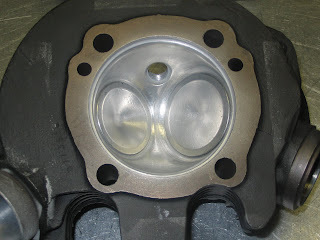 A 2.0" intake valve is enough bigger than the stock 1.940" to allow me to "get some shape" to the seat area. From there I went through and ported the head as best I could with no material added, which gave me 256 cfm at .500 and 259 at .600" lift. Now things are looking promising! Next some clay to add a "hump" to the floor, and fill in the side "divots" and we are in business. A test with the clay installed showed that it would be worth while to have the customer's heads welded up. 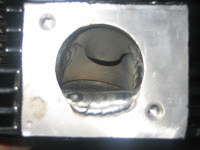 Since the weld came right to the intake seat, I cut the heads for a new oversize seat insert, just to insure that the welding in such close proximity to the seat would not cause it to fall out at a later date. After shaping the newly welded in material to match the clayed up head, the heads were ready for the flowbench again. 256 cfm at .500" lift and 272 at .600 were the final results. More than 50 cfm gain over stock at .500 lift and 65 cfm at .600. Not too shabby. 35 cfm better than a Screamin' Eagle Performance Head. Like I said, not too shabby. Are they the world's best flowing Indian heads? They just may be. Is there potential for more? How much do you want to spend? heads where I use the stock valves ($499). But now I will add a Bare Bones porting job with 2" intake valves and no welding ($625) and of course the Pro Street porting with 2" valves and welding ($1200) A little performance to fit most anyone's budget. 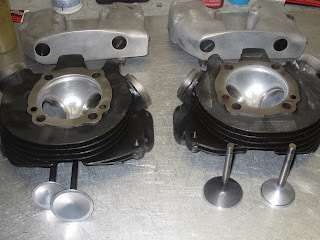 Last fall a long time local flat track racer by the name of Billy Hofmeister approached me about doing some work on his iron XL heads and cylinders. Since I have recently seen a resurgence in interest in porting work on these heads, and have done a few sets in the last year, I agreed to take a look at his heads. His bike is an original factory XLR which is now outfitted with a 1969 XLCH 900 which he runs in local races in the open class. Last time out he had a cylinder break at the base, possibly because it had been shortened in an effort to raise the compression. Another used set of cylinders was in order, as well as some headwork. The heads he had been running had been ported previously, but without benefit of a flowbench. They flowed about as good as can be expected with no way to check the work. Over the winter, as time allowed, I installed 2" intakes and 1 3/4" exhaust valves and a full porting job. Along with the head work, I found a set of 11.0:1 compression pistons. Nothing too exciting here, you might be thinking; and I would agree, but what may be more interesting is the coatings we will be using. Cast iron does a great job of holding heat. Just what you don't really need in an air cooled engine. It tends to lead to all kinds of annoying little things like seized pistons and valves and such. One way of combating this heat build up is by the use of thermal coatings on the engine parts. While this technology is not new (I recall that the fuel class bikes were using them 15+ years ago) I have not seen or heard much about it in regards to antique motors. Seems like a natural, but truth be told, I may not have thought of it except for Joe, one of my customers for whom I recently finished a big twin Flathead stroker build. He had done research on coatings and had many of his engine components done. The whole idea behind ceramic coating is to put a heat barrier on the part to prevent combustion heat from "soaking" into the part. On his Flathead, we had the combustion chambers in the heads, the combustion chambers in the cylinders, the combustion chamber side of all 4 valves, the "back" side of the exhaust valves, and the exhaust ports ceramic coated. In other words, everything that is exposed to combustion temperatures. We also had the a teflon treatment done to the piston skirts. Unfortunately, due to some issues with the company that did the coatings on his motor, (horrible packaging for the return trip leading to broken fins along with coating the wrong ports) I was not about to entrust any parts to them. Luckily there was a local alternative. 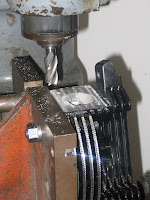 I have been having piston skirts teflon coated by a local business for a number of years. When I asked him about ceramic coatings, he said he had done some a few years ago, and would order some fresh materials if I was interested. I was. So with the start of the racing season only a week away for Billy, I n eeded to get his motor wrapped up. Last Saturday I had Billy drop off the bike so I could do a "mock up" with clay to make sure there were no valve to valve or valve to piston issues. Just a very small amount needed to be removed from the intake pockets to give a little more radial clearance for the larger valves. Thursday morning I dropped off the pistons, heads and valves for teflon on the skirts and ceramic in the combustion chambers, exhaust ports and valves. Friday morning I picked up the finished pieces and started assembly. New high performance valve springs from Kibblewhite were in order, since with the porting work, the engine should want to rev higher. So as of this writing the bike sets on a lift in my shop with just the carb left to install. I, for one, am pretty anxious to see how much the performance is improved with the increased airflow, higher compression, and a cooler running engine! When I left off this story in When Shovelheads Ruled the World, Part 5 , we had just loaded up the dragbike to head to Farmington, North Carolina for the HDRA National Finals. That's a pretty good jaunt from Minnesota, so I had made special provisions. Yes, for the 4th race of the year, we had our 4th different tow vehicle. The year was 1985, and my wife and I splurged and bought a 1979 Dodge van just for the trip! To help with gas expense we bring along another local racer, Guy, with his Panhead that he ran in the Handshift Class. Guy has to be one of the most obnoxious people I have ever known, but hey, gas money is gas money! As I recall, Guy still had to put the heads back on his bike, so we loaded it in the back of the van so he could work on it during the trip. So it was just my wife Jane and I, Bobby, Guy, one other friend, Jim, and a Panhead in the van; the Shovelhead dragbike on our same little open trailer behind. Cozy might be a generous way to describe it. Guy endeared himself to me forever by immediately demanding to know if I had tuned up the van because he didn't want to have to pay for any more gas than necessary, and complaining that he could hear an exhaust manifold leak, and that better not cause too much heat on his feet when he took his turn driving. Kind of took the wind out of my sails as I had felt like quite the hero for going out and buying a van for the trip. Turned out that Guy need not have worried about heat, because his driving was so bad that after one turn, the rest of us unanimously banned him from another turn behind the wheel. In light of the above, undoubtedly the hi-light of the trip to North Carolina came when Jane started to make sandwiches. Guy, with his usual tact, demanded "Jane, make me one of those!" My wife is known by most of my friends to be pretty feisty, so we were all somewhat surprised when Jane complied without any comment. She got her revenge, though, soon after Guy's sandwich was passed back to him. His exclamation upon biting into a sandwich that included a slice of cheese still in the wrapper was priceless. The story of the cheese wrapper has become legendary among the old drag racers we know. We arrived at the dragstrip sometime after midnight on Friday night. Of course the gates were closed, so the best we could do was find a field road approach to park on. No one got a comfortable nights sleep, but at least here the weather was mild. The next morning we were early to the track, and all set for a day of racing! Or were we? The first thing after unloading the Shovelhead, I opened my toolbox to double check all of the fasteners. What do you suppose was the very first thing to meet my eye but all four of the teflon wrist pin retainers! That's right, in my rush to get the bike finished, I did the one thing I had been so worried about. I forgot to install parts, and here we were half way across the country! We were just very lucky that the retainers were in plain sight in the top of my toolbox! So, off came the heads again! No extra gaskets, so I would have to re-use what came off, but that didn't look to be a problem. In short order, I had the motor back together again, and ready to run. With the modifications we had made since the last race, there was no doubt that the bike was faster. I believe that Bobby lowered his own 1/8 mile national record with the first pass. The competition was much tighter than at other races, with other bikes running times close to our old record, but thanks to our new found power, we still had a nice cushion. Again Bobby was kind enough to let me make a pass on the Shovel during time trials. The fact that I ran in the 7.50's with my extra 45 pounds and inexperience showed that the Shovel really liked the new cam and higher compression. Once again Bobby was able to breeze through eliminations with the most exciting moment being when the bike unexpectedly wheelied for the very first time. True, the front wheel came only about a foot off the ground, and Bobby didn't miss a beat, but it was such a shock to all of us, that it remains one of the hi-lights of the race. By the time our class eliminations were done, Bobby had won the Street Racer FL class, and set new 1/8 mile national records of 7.275 seconds, and 99.33 MPH. Our performance in the run off between classes had yet to go our way at any of the races so far. Would this fourth time be the charm? We were sure hoping it would be. A little frustrating to have the quickest street class bike at three races in a row, and still get beat out for the "Street Eliminator" title. Tough part was, there was really no one to blame. Bobby's reaction times were consistently at least as good, and most times considerably better than the competition's. As we checked the bike over to get ready for those final eliminations, everything was looking good. Since Bobby had just lowered the record in our class by about .04 of a second, we knew that he should be in pretty good shape in that regard since he would be indexed on the old record. The last thing to do just before we pushed the Shovel up to staging was to add a little more gas. And that's when it happened. One of those moments that seem that it should be inconsequential, but is locked in my memory forever. I was pouring as Bobby held the funnel. We both watched in disbelief as a minute piece of "fluff" from a tree lazily drifted down and into the funnel. Although it happened rather quickly, it was as if it was in slow motion. To this day I have to wonder if one of us might have grabbed it if we hadn't been taken so much by surprise. We both saw it, then we looked at each other in amazement. Such a small piece, what could it possibly do. I had no filter in the tank, nor in the fuel line, and it would not have been large enough to clog one anyway. Probably not large enough to even clog a jet! We may have had time to drain the tank, but it would have been cutting things pretty close. I made the executive decision and opted to ignore it and run the bike the way it was. Soon we were in the staging lanes and time to start the bike. Only it wouldn't. I kicked, and kicked, and kicked, and kicked some more (I was in much better shape back then). Then Bobby kicked, and kicked, and kicked some more. When we lifted it off its kickstand, gas ran out the carb, so now we knew it was badly flooded. We both knew right away what had happened. Sure enough, our piece of "fluff" that had floated down into the gas tank, had made its way to the float needle and seat, and was keeping it from shutting off the flow of gas. We were about to miss our first round when in a fit of desperation we asked if we could start the Shovel on the rollers that were usually reserved for pro class bikes. Now back in the "old days", rollers were the most common way to start your drag bike. Normally one set of them was set up near the front of the staging lanes. Picture a pair of giant rolling pins about 6 feet long mounted side by side with bearings on the ends and you have a pretty good idea of what rollers looked like. One rear wheel of a car or van would set on one end of the rollers and the bike's rear wheel on the other end. With the bike in gear and the clutch pulled in, the car would accelerate, getting the bike's rear wheel spinning at a good clip. Then when you popped the clutch on the bike, the motor would start turning. At that point when you gave it ignition, it would usually start almost immediately. Neither Bobby or I had any experience starting a bike on rollers, and the Shovel was not going to start easily. Despite all that, Bobby handled it like a pro, so with just a few words of instruction from the gentleman running the car on the rollers, he had the Shovel's engine spinning over. Not starting, just spinning over. Seemed like an eternity, but it was probably less than ten seconds of the engine spinning over on the rollers before it cleaned itself out and roared to life. Now the trick would be to get the bike to the starting line without running it out of gas by leaving the petcock off too long, or flooding it again by leaving the petcock on too long. Ideally Bobby would turn the petcock on at just the right time so that the float bowl would be just reaching full as the lights turned green. We'll never know how close Bobby came to timing it perfectly, but he must have been pretty close. The Shovel launched fairly good, but flattened out pretty bad in midrange. The bike in the other lane, another Shovel (but with a turbo and nitrous) had us by a couple bike lengths by the end of first gear. Each time Bobby shifted, the Shovel would go flat as it was pulled down in rpm's, but would start running clean and gaining ground as the rpm's came up. But then, just as Bobby was closing in on the other bike, he would have to shift, and loose the ground he had just gained. So once again we lost in the first round of the eliminations between class winners. In retrospect, I have little doubt that I never had the main jet quite small enough for the low elevation in the first place, or else the extra fuel in the float bowl wouldn't have given such similar results as being too rich in the Colorado Springs race. So was this a lousy way to end the racing season? Not at all. I don't think any of us spent more than a few moments in disappointment. After all, Bobby had dominated his class at all four races that we attended. Along the way he set a total of four national records. Not too shabby for a couple of guys who just set out to see how their bike measured up!